Update: notes from the meeting. I am glad that BDG is working on improving the neighborhood and that they are coming to talk to the community. I'm really happy that BDG is interested in improving the walking experience around the site, by bringing the building to the street edge, and by adding a mix of uses. I hope you are serious about these intentions. The plan is for 181 hotel rooms, 82 residential units, 19000 s.f. of medical office space, 14200 s.f. of retail/restaurant space, and 228 parking spaces (of which 141 are underground). My estimate is that the underground parking garage will cost between $5-8 million to construct. The residential units come in a variety of sizes: the smallest is 750 s.f. (1BR), then there's a range of other sizes including 957 s.f. (1+ BR), 1099 s.f. (2BR), 1242 s.f. (2+ BR), and the largest is 1311 s.f. (2 BR). The distribution seems to be fairly even. I like this aspect, the smaller apartments seem targeted towards single professionals, but there are also a substantial number of larger apartments which seem to be adequate for families as well. The parking space distribution is broken down into 60 hotel, 78 residential, 60 medical/retail, and 30 shared between commercial uses. This seems excessive. The PNF shows that this provision is larger than BTD's guidelines require, and it is well known that BTD's requirements are already too high. Would BDG be willing to consider reducing the number of parking spaces, or alternatively, adding another floor of residential units? The reason I ask is that the excessive provision of parking spaces causes additional car trip generation and therefore traffic congestion on Chestnut Hill Avenue. I think it is in the interest of both BDG and the community to seek an environment which is more conducive to people and not one that is clogged with vehicles. Along those same lines, will you do more to promote the use of the MBTA, walking and bicycling from this site? You have the unique position of being situated nearly on top of the "D" branch Reservoir station, one of the most heavily utilized stations on the surface Green Line. Residents and guests can almost literally roll out of bed and onto a trolley heading downtown. In addition to that already great access, you have the "C" branch just another few steps away, and the "B" branch a short walk down the street. Are there any additional steps that BDG can take to make transit access as convenient as possible, in order to encourage people to use it, and to reduce the number of vehicular trips to and from the site? This seems to be one of the biggest selling points of the site to potential renters (and in the future, buyers). By comparison, just down the street at the Riverside Station, you have a major development project going on inside Newton, all because of the "D" branch. 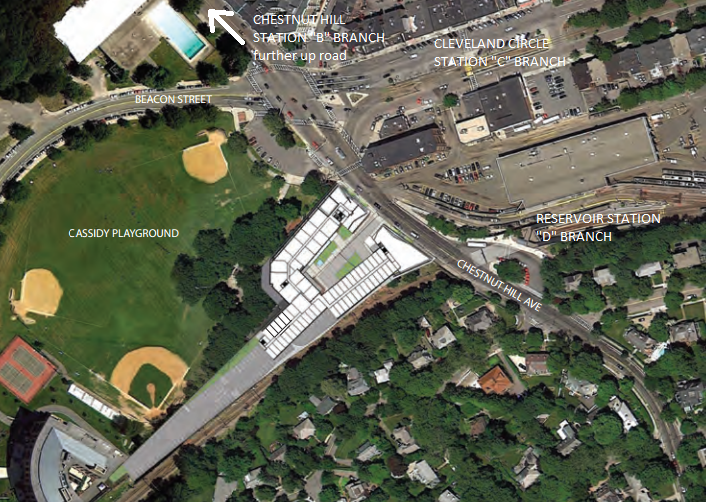 But this Cleveland Circle site has even better access to the Green Line than Riverside. For instance, I believe homes here will be extremely attractive to staff at Longwood Medical Area, people who work in Allston/Brighton, in Brookline, as well as downtown commuters. You can reach most major areas in Brighton and Brookline (as well as Back Bay, downtown, etc) from the trolleys that stop at Cleveland Circle. Would BDG be willing to set some transit/walk/bike mode share targets for residents, employees and other users of the site? Can they implement demand management programs to actually reduce traffic congestion in the area, much the way Kendall Square has succeeded? Can they work on other ways to make walking access to/from Cleveland Circle easier? In conclusion, I think this development is a great opportunity to grow the community in a sustainable way without impacting traffic congestion too greatly. I hope that BDG chooses to take advantage of the incredible public transportation resources that the cities of Boston and Brookline have made available to this site.